From the start of the American Revolution the US sent representatives to European countries asking for help in their fight against the British. Since France was the most obvious place to look for help the Americans sent one of their most impressive politicians in Benjamin Franklin. The war was quite popular among the French not just because it was against the British, but because of the connection to the enlightenment ideas it was based on. During Franklin’s mission he was approached by a young military officer named Marie-Joseph Paul Yves Roch Gilbert du Motier who, due to the death of many of his family members, had inherited the title of Marquis de Lafayette at the age of 12. When Lafayette showed interest in going to America to help, Franklin actually tried to talk him out of it. Since Franklin knew the family well, he was worried about the safety of their young Marquis (a noble rank) in a fight he didn’t know if they could win. 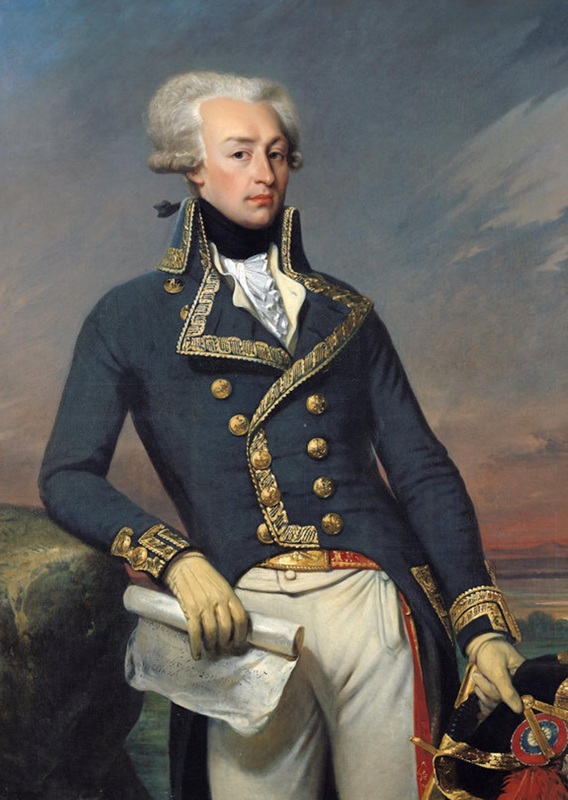 Lafayette would go directly to the King to ask if he could be allowed to postpone his military service so that he could help in the war, but the King wasn’t willing to lose a man that was generally known to be the brightest young officer in the entire country so some hopeless rebellion. Instead of following orders he would choose to use his own money to sail to America in disguise, being chased the entire way by the Kings men. When he finally reached America he was told by the Continental Congress that he wasn’t needed, and that they were growing tired of French “Glory Seekers.” The reply Lafayette gave shocked the founding fathers when he told them he had 2 conditions. He would ask to be allowed to fight without the pay usually associated with that and also to be admitted as a normal soldier instead of an officer. These requests would impress the Congress so much that they made him a Major General and sent him to George Washington for placement. men in defense of the other troops before they retreated. He would be given a citation for bravery and was recommended for command by Washington himself, who claimed his actions were flawless. Lafayette would become more important to Washington as the war progressed, talking the Oneida tribe into fighting on the American side, calming a near riot near Boston, and even tipping Washington off to a plot to remove him from command. In every situation he seemed to know the exact correct move to make and was cited for bravery numerous times by the Continental Congress. In the last months of the war he would be placed in charge of Virginia by Washington. This may not seem like a major move compared to the others but it actually clearly shows how valuable he had become to Washington. This was Washington’s home state, so he was entrusting Lafayette with the defense of his home and family at that point. He would be the person who cornered the British at the Siege of Yorktown, which led directly to the victory here and the official end of the war. Lafayette would return to the US after the end of the Revolution on 2 separate occasions. He returned the first time soon after the war (1784), spending a great deal of time with Washington at his home in Mount Vernon. The 2 would develop a relationship that bordered on a father-son relationship during that trip, but he traveled to nearly every state after this visit. He would be given a ton of honors while on this trip including an honorary degree from Harvard and being made a natural born citizen by a few states. He found the citizenship issue quite amusing since the concept didn’t even exist in France at the time, so it was the first citizenship he had ever been given. Years later he would be invited by President Monroe on a grand tour of the US (1824-1825) where he visited all 24 states in a 6,000 mile vacation as a part of the 50th anniversary celebration. During this trip he would famously take time out to visit the tomb of Washington and speak to Jefferson about the need to free the slaves of America. Though we seem to have largely forgotten about him in recent years, Lafayette was a monumental figure in early American history for both the regular citizens and the founding fathers. No citizen of a foreign country has ever had as many admirers in this country than Lafayette, which can be seen in all the different statues, parks and cities named after him in this country. Among the most impressive examples of this would be Lafayette Park (1824) which located right in front of the White House, and the fact that the US National Guard is named after the group he created in France. After his death in 1834 the US went to great lengths to commemorate his life and his impact on our country. President Jackson decided to give him the same funeral rights as US Presidents and would send people to Paris to make sure that soil from the battlefield at Bunker Hill was used in his burial. Within the United States flags would fly at half mast for 35 days after his death, military officers wore French style military jackets for 6 months, Congress asked the entire country to wear black for the next month as they would not only do that but hang black in the chambers of Congress during that time also. The tributes would eventually dull, but he would remain on our minds as time passed. When the US military joined the fight in France during the First World War, officers under Lieutenant Colonel Stanton would stop at his gravesite, place a US flag and claim “Lafayette, we are here,” with the idea that they were here to repay the debt to him. This would start a trend of keeping a US flag on the gravesite that is replaced each year by French and American troops on the 4th of July. His most recent honor came when President George W. Bush would grant him honorary citizenship (2002), which was not the first time he had received it, but it was the first time from the federal government as opposed to state governments.